For this review MommyBlogExpert's kids were excited to have the opportunity to try out the HEXBUG Inchworm from Innovation First International's Micro Robotic Creatures line. Readers can also find this cute gadget featured in the 2010 Sparkling Fresh Gift Ideas for Easter & Other Spring Holidays. Pictured above is HEXBUG's Inchworm along with the miniature infrared remote control which fits in the palm of one's hand. My four kids (triplets who will soon be 13, and their big brother, age 14) and I were already familiar with this brand prior to test-driving the Inchworm since we had previously tested another of the company's products, the Hexbug Nano, that was included in Hanukkah 2009 Most Memorable Gifts and in Kid Christmas 2009 Gifts Enhancing Family Living. 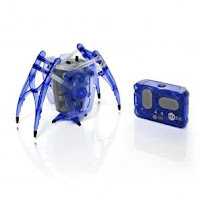 Though the HEXBUG Inchworm looks nothing like the real thing and this hi tech insect measuring just over 3 inches in length more resembles a Tarantula in appearance (especially in this blue color), don't let that fool you. Thanks to the mini remote control unit that comes with it, it is loads of fun to operate with its seven-way steering range. It's equally entertaining to watch as this Inchworm robot crawls along, which two of my kids described alternately as moving with a pinching motion and waddling like a duck with spiky toe nails. 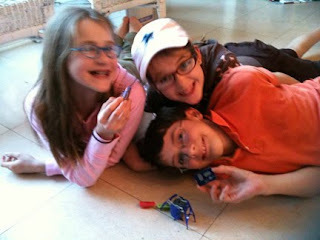 As the kids play with the new Inchworm alongside their HEXBUG Nanos in this blurry photo of the triplets, taken by their big brother, you can practically feel the frenetic energy, can't you? True to the media fact sheet we received with it, this little robot toy can even do 360 degree rotations when stopped on its center pod foot. In addition, the maker does state that the product's controller is outfitted with two channels so it is possible for two bugs to be operated independently or at the same time. Since we received just one Inchworm we were not able to actually test this function and confirm that particular claim. Though we did find it to be innovative and entertaining, my kids and I would caution users to play with this carefully -- like they would any other delicate toy -- because it is made of plastic that appears somewhat fragile and could possibly break if handled too roughly. Actual measurements of the HEXBUG Inchworm, which weighs just 1.8 ounces, are 3.15" long x 1.57" wide x 2.56" high. Two button cell batteries are included in each Inchworm and accompanying tiny remote controller, which measures about 2" x 1-1/4". Packaged in the dome-shaped see through packaging shown here, this is available in such futuristic translucent colors as Indigo -- the color we received for this product review -- as well as Red, Green, Orange and Pink. Keep in mind that, as the box warns, this product has small parts so this play thing is not suitable for children under 3 years old. The HEXBUG Inchworm, which is recommended for ages 8+, retails for $19.99 USD and is available at RadioShack stores nationwide. It may also be purchased from other specialty retailers internationally or at the company's website www.hexbug.com. Other robotic creepy crawlers in the HEXBUG Micro Robotic Creatures family of products include the Ant, $11.99 and the Crab $14.99, both which come in different choices of hues and are available at various retailers. 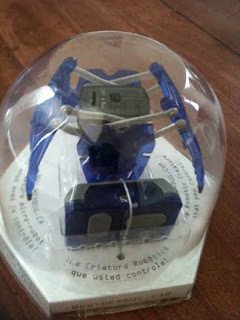 FTC Disclosure: For this review MommyBlogExpert received a HEXBUG Inchworm. MommyBlogExpert did not receive any payment or other compensation associated with this post. See complete FTC Disclosure information that appears at the bottom of MommyBlogExpert's main page and at the bottom of every individual post on this blog, including this one.